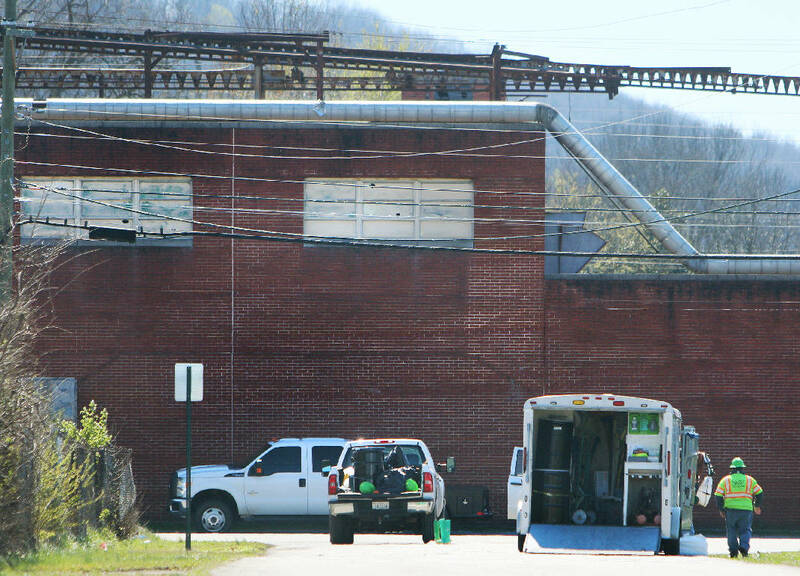 Two days before Walker County, Ga., development officials planned to review offers to buy an old mill, a hazardous material linked to cancer spilled from the building. Police officers and emergency workers in hazmat suits responded to the former Coats American plant in Rossville around 7 p.m. Sunday, when a resident reported seeing an oily sheen on the water in a ditch across the street. The oil came from a transformer that had tipped over inside the abandoned mill. Emergency responders said it contained polychlorinated biphenyls, a chemical linked to several health risks. No longer made in the United States, manufacturers once used PCBs as a coolant in transformers. Multiple studies in the 1980s and 1990s concluded long-term exposure to the chemical can cause cancer. Eating PCB-contaminated fish can stop men from reproducing and increase the risk of neurological development problems in children. Walker County spokesman Joe Legge said emergency workers contained the spill in about four hours. They believe only about as much oil spilled as would run off from a large parking lot during a rain shower. Investigators found copper in a knapsack and some tools inside the building. They believe thieves came to strip the copper out of the building and tipped over a transformer. Each transformer holds a 50-gallon drum of oil. Legge said a $1,000 reward is offered for information leading to the arrest of the thieves. "If anyone has seen anybody coming or going in that building recently," Legge said, "please contact Rossville police or the Walker County Sheriff's Office." Georgia Environmental Protection Division spokesman Kevin Chambers said the oil spilled into a storm drain inside the building. The drain runs to the Williams Street tributary and eventually to the Tennessee River. Chambers said, responders contained the oil with booms, long tubes that block water from running downstream. They also put pads of absorbent material in the water to soak up the oil. He said four of the eight transformers inside the building were empty Monday. But that doesn't mean they all spilled over at once. He added that nobody has reported dead fish as a result of the spill. "That leak could have occurred over time," he said of the other empty transformers. "So it's not likely all of it flowed into the tributary at once." The EPD has asked Walker County to amend its Corrective Action Plan for the site. The county must test soil taken from the site for PCBs, which had not been found at the Coats American building before now, and for volatile organic compounds such as benzofluoranthene and metals. If those are found, they will have to be cleaned up, EPD said. In January, the Walker County Development Authority issued a request for proposals on the Coats American building, formerly a textile manufacturer. The county has owned the abandoned 200,000-square foot mill on Maple Street since 2007. The authority is supposed to review the bids during its meeting this morning, Legge said. Walker County Economic Development Director Robert Wardlaw did not return a call seeking comment Monday. In 2005, the EPD placed the building on its Hazardous Site Inventory because benzofluoranthene, a chemical, leaks into the groundwater in the building. According to an EPD assessment, the leaking does not contaminate drinking water. The closest well is somewhere between half a mile and one mile away. The EPD ranks the building as a Class II site, meaning someone needs to investigate it more before deciding whether the environmental agency needs to take action. The listing does not mention PCBs. According to the U.S. Centers for Disease Control and Prevention, researchers have linked PCBs to several health risks. A 1987 study of two plants that produced electrical capacitors found a "significant increase" in cancer among its workers, primarily in the liver, gallbladder and biliary tract. Three other studies of workers at plants with PCB found links to skin cancer, and two studies found links to brain cancer.